Flooring, often an expensive investment. Flooring adds beauty and comport to any home or business. With floor covering, there are potential problems. Floor failure can be a devastating loss. When your wood, laminate, carpet or LVT floor fails to perform, it’s time to call the experts. We will find out why! Most flooring dealers, installers, contractors and floor covering manufacturers want the best for their customer. At the same time, no one wants to take blame for flooring failures they did not cause. Floor failure, often a mystery requiring a floor failure analysis specialist. When you have a floor failure, you need the Weinheimer Group, a Pacific Northwest company serving Oregon and Washington. 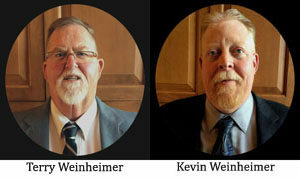 Terry Weinheimer and Kevin Weinheimer are nationally respected wood, laminate, luxury vinyl and carpet inspectors. They have inspected thousands of failing floors. Terry and Kevin are industry experts, certified by national and international certification organizations. Clients range from homeowner and contractors to dealers and manufacturers. Weinheimer Group Floor Covering Inspectors are nationally recognized experts. When a floor fails our non-biased, independent, certified experts, identity the potential defect, define the problem and document the cause. The Weinheimer Group, a Pacific Northwest based, nationally known flooring inspection company. We investigate, tests and document flooring problems. Hardwood, laminate, bamboo, luxury vinyl and carpet. Requesting an inspection is easy. Fill out the online form to request an inspection. We will get back with you to discuss the concerns requiring inspection and give you a price. If you prefer, give us a phone call at 800.621.3427. When a floor covering fails, there is a lot of finger pointing. Everyone involved blames someone else. As certified, non-biased, independent, flooring inspector experts, certified by national certification bodies and manufacturers, we identity and document the cause of flooring failures. Terry Weinheimer and Kevin Weinheimer, NWFA CP Certified Flooring Inspectors. NWFA Certified Flooring Inspector are National Wood Flooring Association Certified Professionals (CP). Hardwood flooring is an expensive investment that should offer decades of service. Unfortunately, many hardwood floors and their installations are failing prematurely. NICFI Inspectors are Independent Flooring Experts The Weinheimer Group, proud members of NICFI. National Institute of Certified Floorcovering Inspectors are the best in the floor covering inspection industry. The membership of the NICFI is comprised of certified floor covering professionals that are located throughout the United States and Canada. FCITS Carpet and Flooring Inspector Certifications Kevin Weinheimer and Terry Weinheimer, independent FCITS Certified Carpet Inspectors and Flooring Inspectors experts with over 60 years combined inspection experience. FCITS Certified Inspectors are recognized by carpet manufacturers, fiber companies and flooring manufactures worldwide.